So many beds! But which one is right for your dog? The sheer number and variety of different dog beds out there can be a bit bewildering but it’s really just a case of spending a few minutes to think about your dog’s individual needs, health and lifestyle. Your dog will be spending nearly half of every day lying in his bed (or even longer if he likes his afternoon naps!) so it’s worth taking a bit of time to find the right one. Read on for our guide to the different types of bed and how to get the right size for your pooch. If you are not too sure what size of bed you need then take a quick look at our Dog Bed Size Guide. As a general rule, measuring your dog from his nose to the base of his tail will give you a minimum length for a soft nest bed – add another foot for a mattress bed. Dogs are individuals like us so watch his sleeping habits – does he sleep curled up in a ball or is he stretched out to the max? Most dogs will change position quite a bit during the night so a bed will need to be big enough to allow for this natural movement which evens out pressure on the body. For dogs who like to snuggle up in a corner, a soft nest style bed will be a sure-fire hit. Smaller dogs love this style of bed and raised sides will give your dog an added sense of security. Plush dog bed Leika for small dogs is a luxurious hideaway that your dog will adore – just watch out that the cat doesn’t steal it! 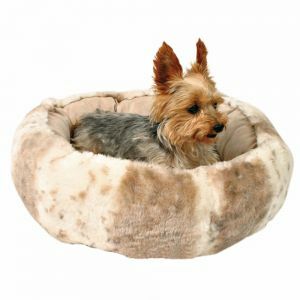 For medium and large size dogs, try our deep and cuddly Dog Bed Cozy Mocca made from super soft fabric. If your dog really feels the cold then it might be worth buying him a SnuggleSafe heat pad. These clever pads can be heated up in the microwave and stay warm for up to ten hours. 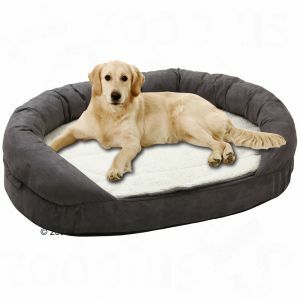 Mattress style beds are great for bigger dogs with long limbs who might feel cramped in a round, nest style bed. These beds also give maximum freedom for all the twitching and moving around during dreams about chasing next door’s cat! If your dog is always trying to get on your bed, then that’s probably his way of asking for a nice big mattress bed. Our Cozy Dog Mattress Mocca may not look that sophisticated but it’s tough and super comfortable – and the sensible colour won’t show up the dirt! 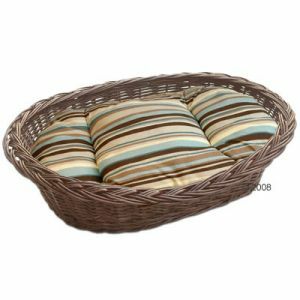 A traditional dog basket can make a great, sturdy sleeping place for your dog but as they are made from rigid materials, make sure you get one large enough for your dog to stretch out comfortably. Plastic beds are very easy to clean and normally come with ventilation holes so bedding does not become too stuffy. 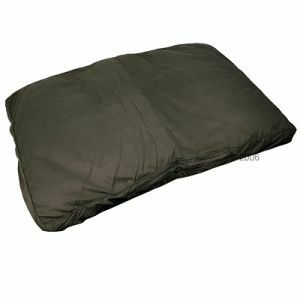 Choose from our range of cushions and blankets to line a plastic bed and make it extra cosy. Wicker baskets add a bit of country charm to your home. These can be bought on their own and decked out with a cushion of your choice or why not try one of our saver sets, complete with a reversible pillow. Does your dog feel a bit stiff first thing in the morning? If he’s getting on in years then it may be worth investing a little more cash in a bed designed to help combat the inevitable side effects of old age. Memory foam is now well recognised as being beneficial for humans suffering from arthritis or back problems – and it can help your dog too. Have a look at our OrthoBed Oval or OthoBed Rectangular. Our spelt cushion beds are also great for pets with mobility problems. The husks have a massaging effect on sore and tired muscles and the natural materials also help your dog keep cool (spelt husks retain heat and allow air to circulate freely). Dogs are messy, it’s a fact! Whether you have a young pup who is still toilet training, a rescue dog who has accidents due to separation anxiety or simply a pooch who loves to get into the muddiest, smelliest bit of pond water available, a waterproof mattress will be able to cope with whatever your dog throws at it! 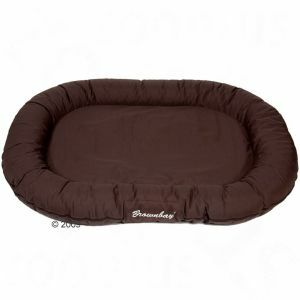 Mattress Dog Bed Brownbay is the ultimate design for practicality and comfort. This bed is available in an extra large size (140cm long and 105cm wide) and also comes in blue and red. When it gets hot and sultry in the summer, you may find that your dog ignores his big fleecy nest bed in favour of stretching out on a cold, hard floor! You can kill two birds with one stone by buying one of our reversible Cuddle Cushion Bordeaux Stripe beds. One side has cool cotton stripes for summer and the other is made of sumptious, dark coloured corduroy, perfect for chillier months. We have so much choice in our Dog Bed range at zooplus that we are certain you’ll be able to find a pet bed that will fit in seamlessly with your current décor, or even make a bold design statement if that’s what you are looking for! 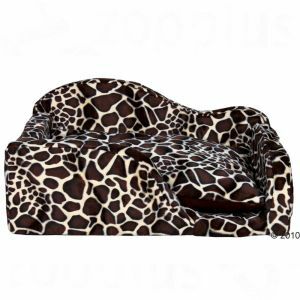 For a touch of real glamour you could treat your miniature pooch to our Trixie Cuddle Sofa Caroo with sassy giraffe pattern and stylish curves. Can I cancel the order inside thirty days if I opt to not keep it? You can cancel your contract within 14 days of delivery, without being obliged to state any reasons. To comply with this time limit, all you need to do is to either return the goods bought online or send a return request within the 14-day period by e-mail, telephone, or fax.